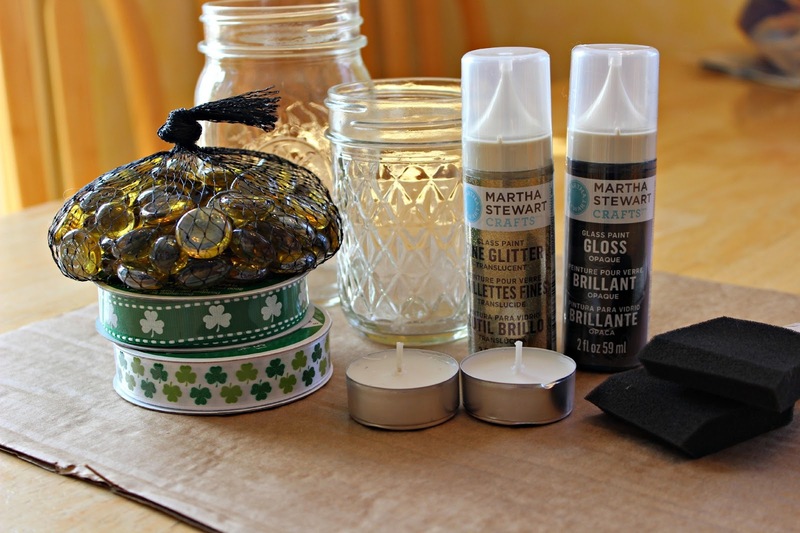 Are you looking for a fun, quick way to spruce up your St. Patrick’s Day table? 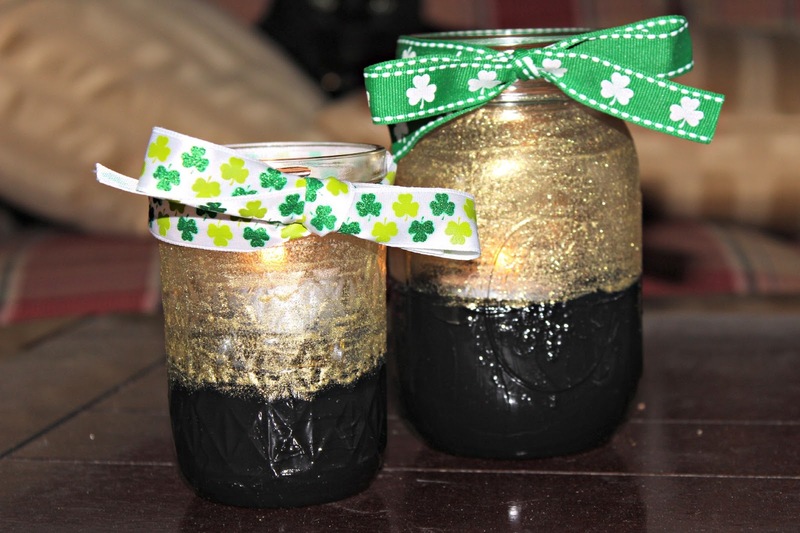 These easy ‘Pot of Gold’ candle votives are perfect for adding a touch of gold ambiance without giving off the dreaded ‘tacky’ vibe common in St. Patrick’s Day decorations. 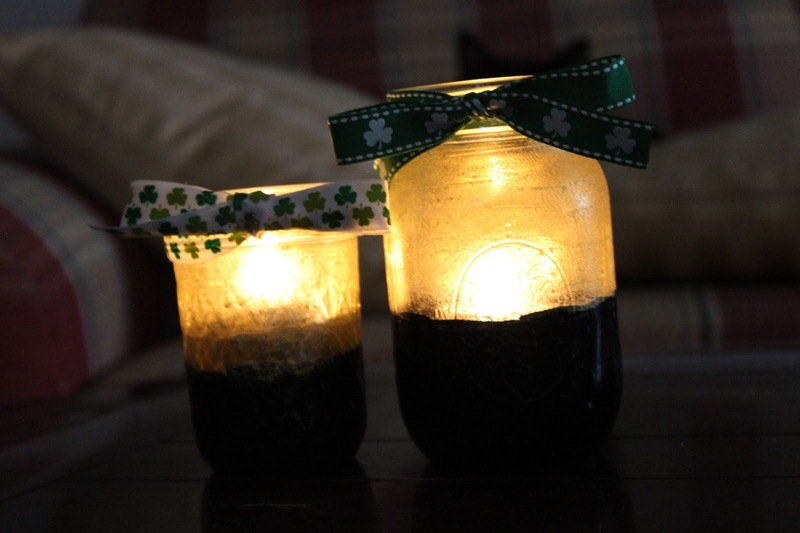 Plus, you can never go wrong with a Mason jar DIY! 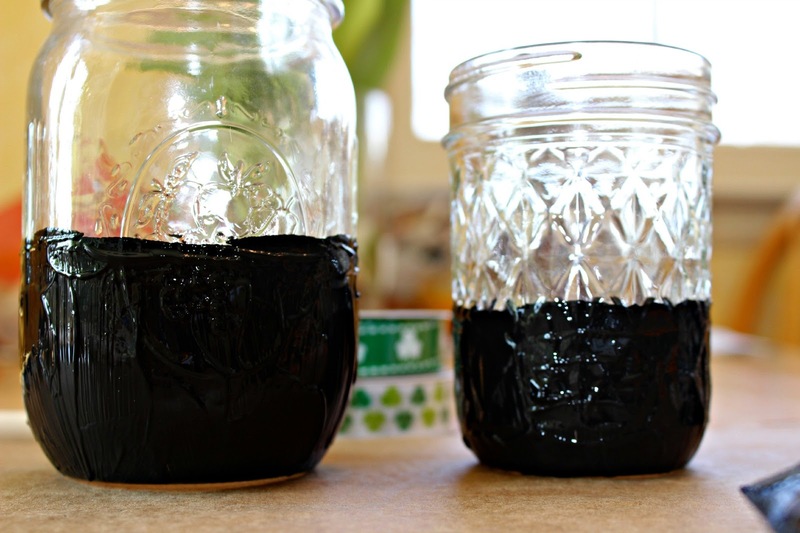 First, make sure your Mason jars are clean and dry. 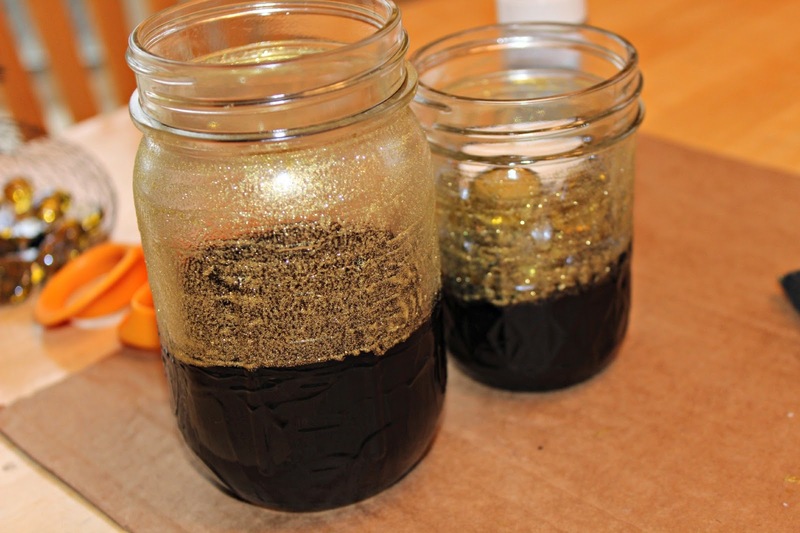 Then, using a sponge applicator, paint the (outside) bottom portion of each jar with the black glass paint. You do not need to be incredibly careful to make sure each paint stroke is neat; the texture of irregular strokes adds depth to your project. Let the paint dry. Next, add a layer of the gold glitter paint. I painted the remainder of the Mason jar until right under the screw-top threads. This particular paint comes out opaque then dries translucent, leaving just the gold glitter. Make sure you wait for each coat of paint to dry before adding another so you don’t over-glitter. You want plenty of candlelight to shine out! Let dry. Add a length of ribbon over the screw top threads. Tie this in a bow for a ‘finished’ look. Finally, add your gold or yellow marbles to create a base for your tea lights. I found that filling the mason jars up to just below the top of each black-painted section allowed for the best amount of candle light to shine through. 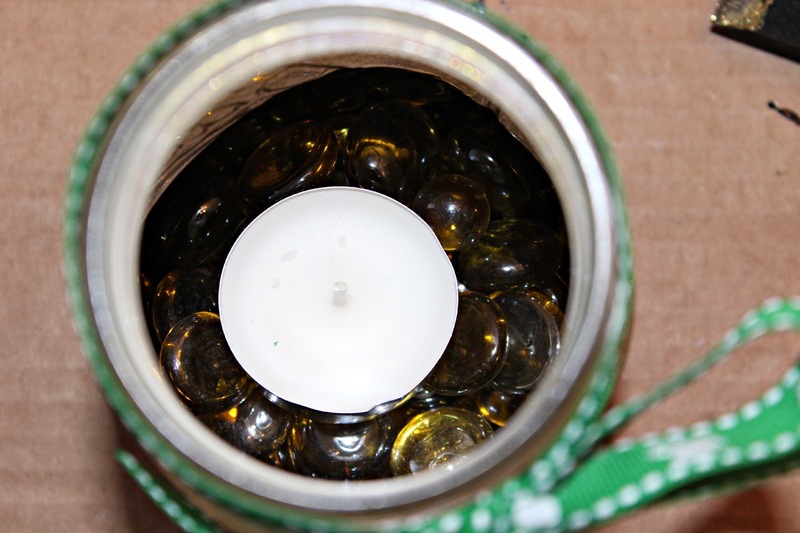 Place a tea light on each base of marbles, light, and enjoy your glowing pot of gold! 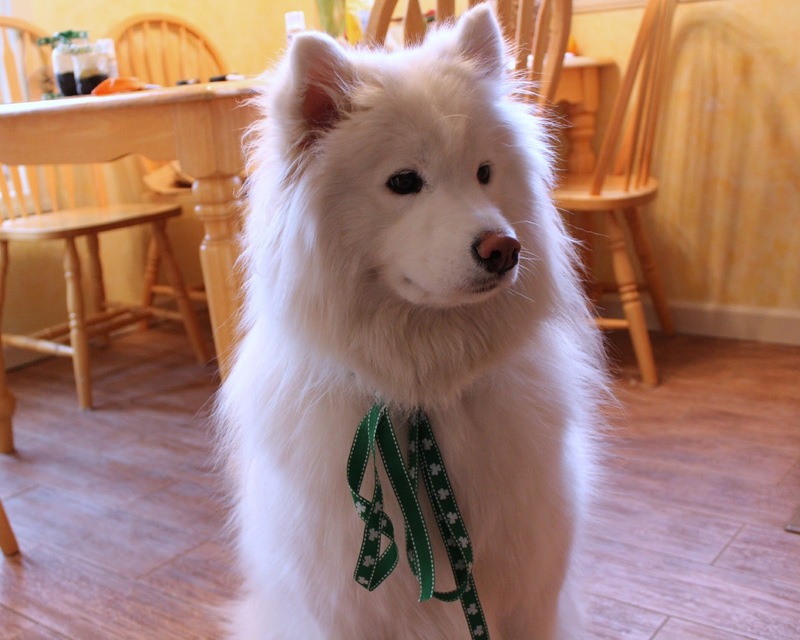 How are you celebrating St. Patrick’s Day? Let me know in the comments below!